In recent years, we have witnessed increasing global inequalities that have generated forced migrations, the return of policed borders, and the resurgence of structural racism at all levels of government, media, and public. At the same time, new forms of resistance and social mobilization—such as Occupy, the Arab Spring, and Black Lives Matter—have emerged, shaping new contours of transnational and transcultural alliance-building, as well as new cultural and media formations. As the US prepares for another coup in Latin America, so does the global resistance against imperialism. In response, many scholars have recently attempted to reinvestigate and reassess earlier iterations of global solidarity movements. Examples include the relationship between radical Black movements in the US and the Third-Worldist internationalism of the 1960s-70s via the Algerian revolution, the Cuban Tricontinental movement, and other hot spots of decolonization. Cinema and the moving image provides us with key vantage points in the analysis of these historical formations, as they formed an integral part of these movements – whether in solidarity, like William Klein, René Vautier, Gillo Pontecorvo, Third World Newsreel or as active participants in the struggle, as was the case with the Palestine Film Unit, Santiago Alvaréz, or Sarah Maldoror. This workshop brings together a group of scholars who have been involved in reconstructing the cultural history of militant cinema, in an attempt to question the potentialities of this legacy to form a dialogue with contemporary forms or resistance. 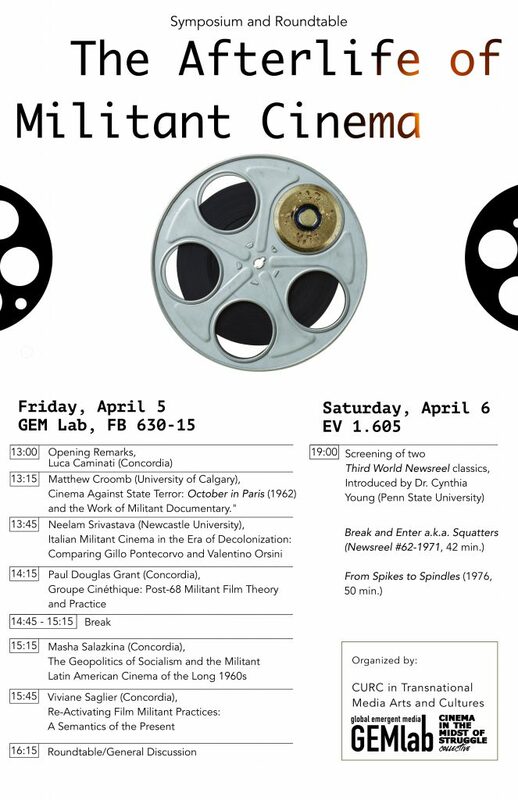 Through a series of presentations, responses, and discussions we hope to create a sustained discourse which brings together a history and theory of decolonial approaches to film and media. Some questions that we would like to address: How can we think of the relationship between theory and praxis, then and now? Can we still think of Third (World) Cinema today? Do the histories of exclusion (of women, sexual minorities, of racial differences), which marked the history of radical cinema in its heyday in the 1970s, necessitate a total break with the present possibilities of solidarity? Has the new visual democratization brought about by the digital revolution significantly changed the terrain for radical political filmmaking? The afterlife we evoke in the title of our workshop is to be interrogated, and the affinities between past and present are yet to be written. 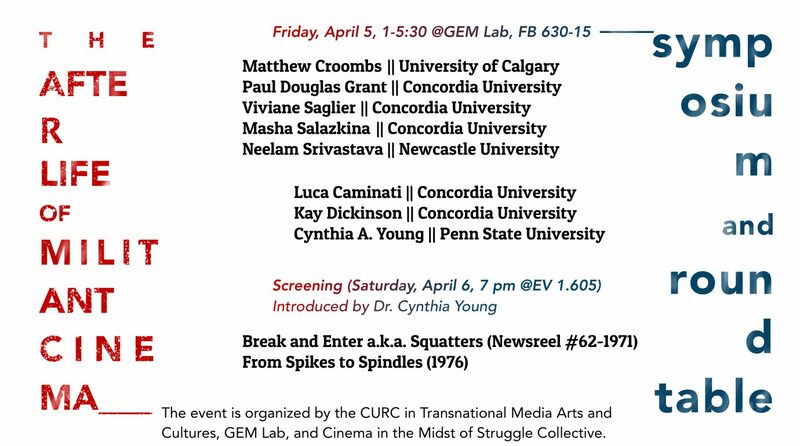 This event is organized by the CURC in Transnational Media Arts and Cultures, GEM Lab, and Cinema in the Midst of Struggle Collective.